This quote takes me back to the trip to Iceland I went on in 2011. We'd spent the morning hiking to the top of a hill to see a glacier, and after eating lunch at the top and taking in the spectacular view, we started trekking down again. It was a particularly cold day and it had started raining, and by the time we got back to the bus I was ready to dry off and get cosy back at the hostel. However, before we set off, we drove closer to the glacier and were given the chance to actually go and stand on it. My hands were bitingly cold and the rain was only getting heavier, so I stayed behind along with a few other people. 'You're not going?' one of the teachers said to me. I told him that no, I wasn't, I was much too cold, but then he said to me 'It's not the things you do that you regret, it's the things you don't do'. And with that, I scooted out of the bus and caught up with the group who were going to stand on the glacier. Since then, that quote has stuck in my head, and whenever I'm unsure about taking a chance, I remember it. Now, I'm trying to apply it to bigger things; life changes rather than opportunities to do things. 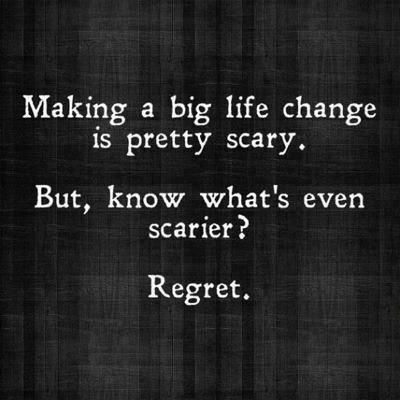 Don't get me wrong, it doesn't make it any less scary, but the thought of regretting not taking a chance or making a change scares me even more than the change or chance itself. If you never take that chance or make that change, you'll never know where it could have led you. There's nothing worse than missing out on something then finding yourself wishing that you had gone for it, or regretting the fact you didn't, and the only way to avoid those feelings is to let go of your fear and just go for it. If you feel like taking that job or going on that trip or speaking to that person could bring you excitement or happiness or bring you closer to where you want to be, then do it. Get out there and take those chances, make those changes, stand on that glacier. Because if you don't try, you will truly never know.